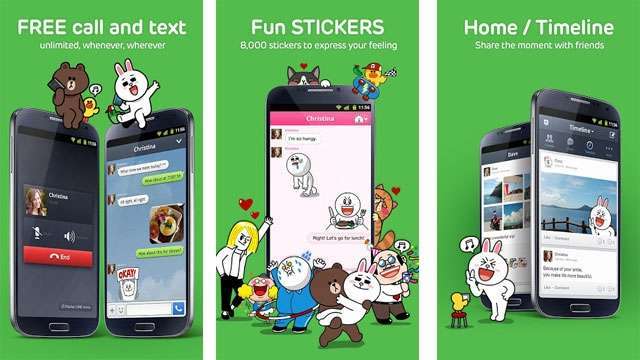 Fresh on the heels of the successful launch of Tencent's WeChat, Japan's Line Corporation has entered India with its cross platform messaging App called Line. What is more important is that it supports PC and Mac in addition to Android, iOS, BlackBerry, Windows Phone and Nokia Asha and the dream of us all, it is free. The instant messaging App also has features like free calls, voice chat and stickers. To make it more appealing to Indians, the company has launched a Hindi website in addition to the English one. The App is similar to WeChat because Line also has the features features like voice messaging and stickers Indians which we got to know from WeChat. However Line has a nice range of its own stickers like Disney, Hello Kitty Iron Man. The features of Line . Do remember this App uses internet to communicate, hence be sure to have a unlimited data plan while using it. Visitors who want to read about it and download it in Hindi please head over here. Android users can download the App from Google Play here. iOS users can download the App from Apple Store here. Windows Phone users can download the App from Windows Store here. Supports Windows Phone 7.5 and 8. BlackBerry users can download the App from appworld here. Nokia Asha users can download the App from OVI store here. Windows users can download the App for their PC here. Mac OS X users can download the App for their Macs here. Windows 8 users can download the App for Windows 8 here. Its about falling in love with your things with sticker india, by making it creative and beautufull and attractive. Stickers let your things speak your thoughts.